Taken April 25, 2008, in North Vancouver, BC. This photo is also being posted for Carmi's Thematic Photograpic theme of the week, faded. 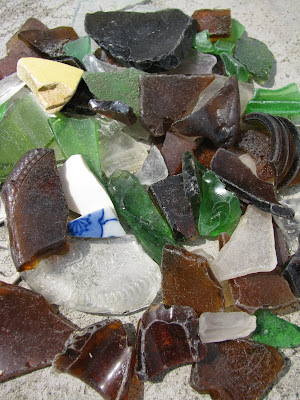 When my kids and I walk on the beach, we always keep an eye out for sea glass. This was our booty on spring day. I've always loved sea glass. To me, it's much more beautiful and interesting in its scuffed and faded state. Cool picture! I remember collecting sea glass when I was little! Love the sea glass and the little piece of plate in there makes it very interesting! Love sea glass... any plans for a project with your booty?? The weathered glass is in it's own way kind of beautiful.